They were too sweet, too innocent for plucking. I assure you my heart is replete with love for you. And come out so we may practice moonlight kissing! I bring you no worse a gift than myself. Nothing of my purse remained. Ahhh! How cold this midnight shower is! How are you Randy? How’s that infection? You remembered. How nice. Thank you for asking. I am much improved. Four more days to go on the antibiotic. But the real question is: how are you feeling and doing with your health? I haven’t seen you write about it lately. I hope you are better and whatever it is has gone away or, at least, is not so serious as you initially thought. I’m glad to hear from you about your situation, however, I’m sorry to hear that you’re feeling dissatisfied with medical treatment. If I could, I’d encourage you to continue pursuing medical attention despite your feelings about their interest levels. It is ultimately your health that matters – not their demeanor. Please take care of yourself. Act in your own best interest, and do not put off seeking help. First smile of the day….and a giggle…really cute! Sounds like my husband. Ha ha. Cute poem. You sure made me think of My Mr. Impeccable’s dooming blue eyes then kiss in the starlight. What else could there be at such a moment. What a sweet twist on such a suggestive picture. 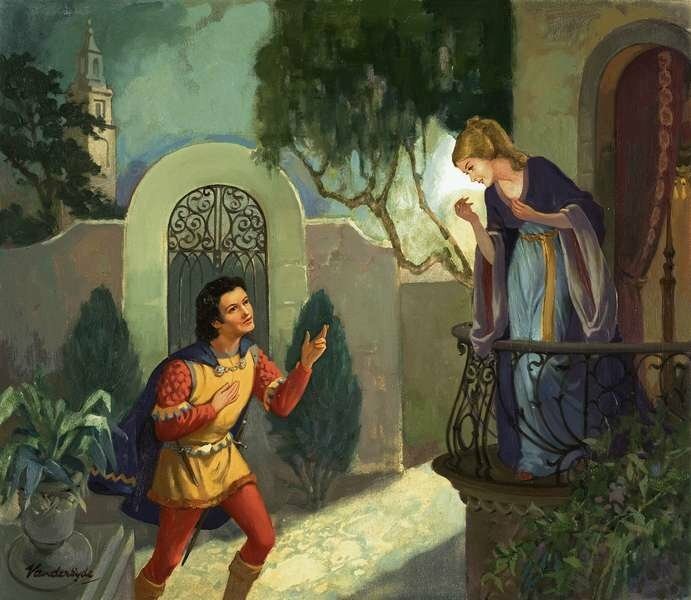 (I mean only that it appears to depict Romeo and Juliet). Love it! Nothing more to add….perfect. I haven’t been blogging much recently, and getting back into the blogging routine is harder than I thought! How are you, Vincentiu? How is your health at the moment? I am reasonably well but quite thin. I’m done with doctors for now, though. Not sure about the future but I like to believe that slowly I am giving up worrying and appreciating life more. How are you Daniel? How’s Ireland at this time of the year? I’m good! Life’s been great since I met Eve! 🙂 Ireland is surprisingly less rainy, but far more cold at the moment. I’m hoping there will be more snow like in December!